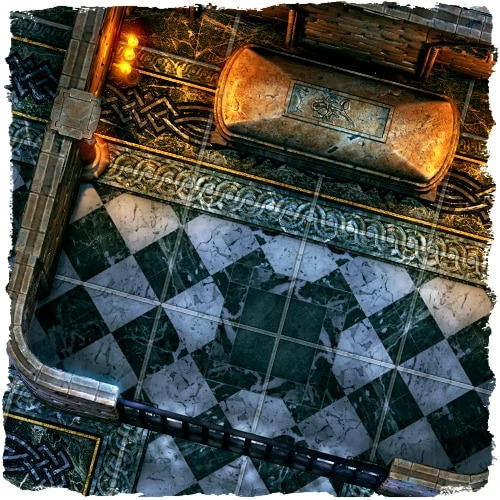 The Cities of the Black Scrolls - Cathedral tiles are finally here! 30 double-sided tiles that are containing corner, sidewall, open and gallery areas with placable and cut-out parts like columns, doors, tombs, and crypt entrances. The areas are on 6 inches by 6 inches sized, double-sided tiles with seamless borders that make it possible to mix them with each other. If you are the type who likes the wonderful and breathtaking visual worlds of movies and games, then you can relive them on your gaming nights sitting around a table in your home (or online) with your friends. You will get 56, double-sided cathedral tiles. Check the "publisher preview" under the cover for more details about the content! Variate, re-usable and modular tiles to help you create diverse fortresses quickly and easily and to save you time and money. Spend more time with the adventure and NPCs instead of seeking new maps to the different adventures. These tiles will always be handy. The artwork is so freakin' awesome I'd almost rather display them framed on my wall instead of laying them on a table! Hmm... maybe I'll do both! !